Morocco is a beautiful country with a wide-ranging landscape and vibrant and bustling cities. The coast is full of quaint fishing towns and some of the world’s most unique surf spots, while inland buzzes with bustling souks crowding the winding Medina streets. Looking past the snake charmers, wonderful rugs, stray cats and Arabic design found everywhere, await welcoming hosts and beautiful people. But the question remains. What is a westerner to wear in a country as unique as this? 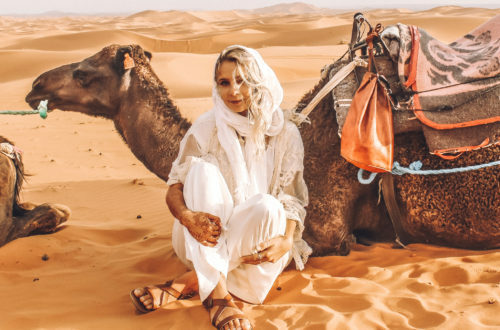 Here is your guide on what to wear in Morocco as a woman. Visiting Morocco soon? 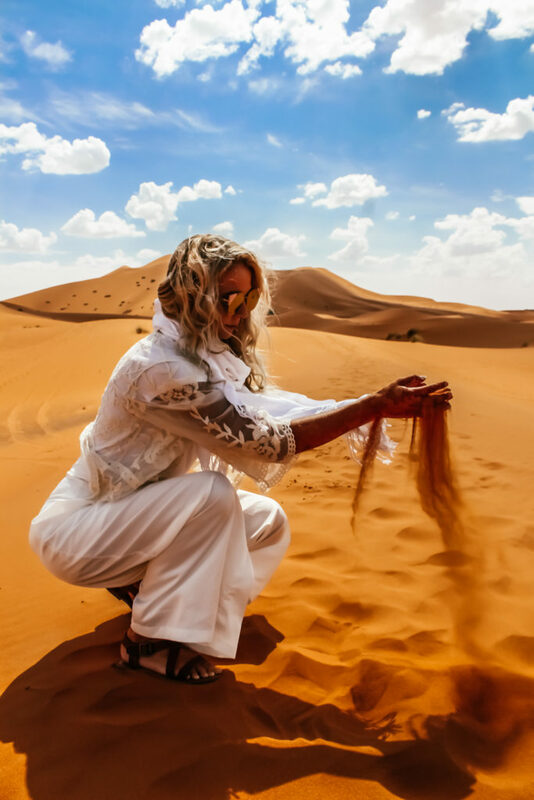 Check out my advice on visiting the Sahara Desert! 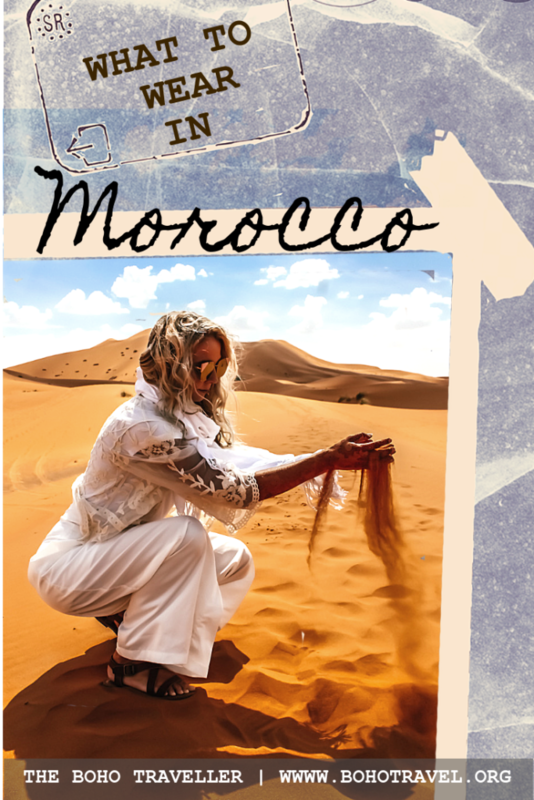 Also Click here to get my free printable packing checklist for Morocco! Morocco’s population is majority Muslim. Please respect the Muslim culture and yourself and dress accordingly. This doesn’t mean you have to go full send hijab, but you should dress more moderately than you are used to in most western countries. Shoulders and knees should be covered, and since it is a desert, you are going to want the clothing to be loose and flowing. Check out some of my favorite styles from this trip. Visit Nasty Gal for a similar style. It’s totally possible to dress super cute in Morocco and respect the culture you are visiting. For similar styles check out Saved by the Dress. To be honest with you, there isn’t a lot of Nightlife in the Tourist Sections of Morocco. If you’re lucky enough to make friends with a local and go to one of the clubs or bars in the big city, the people there will be dressed like any nightclub anywhere, except perhaps slightly more modest. We had the pleasure of going to a club in Marrakech and there was a belly dancer who performed. It was amazing. 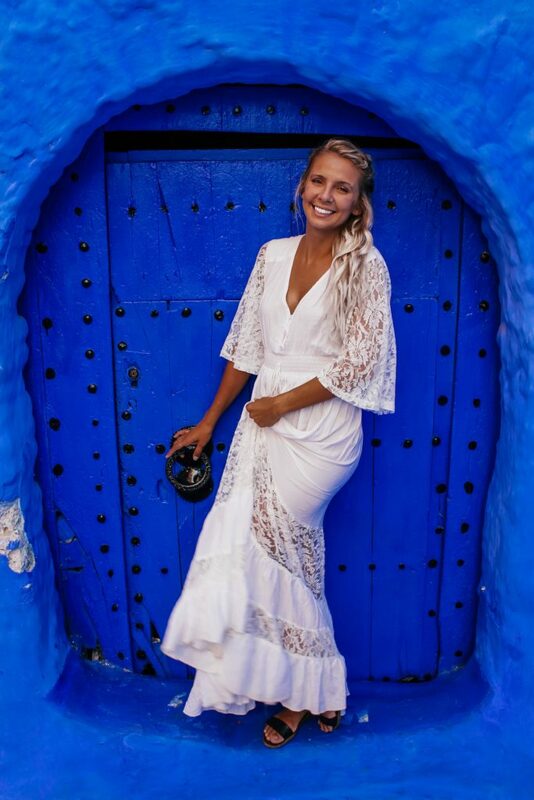 What to wear in Morocco at your riad? Swimwear. But not any swimwear….a bathing suit to match the culture and the vibe of this puzzling country. Turn heads with amazing swimsuits like this one at the Riads in Morocco. 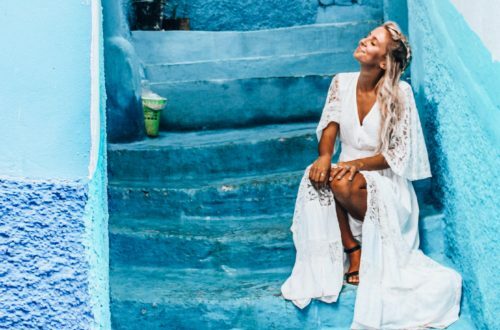 The blue matches the perfect aesthetic of Morocco’s Vibrant Culture, and the one piece makes it just a little more demure for the cultural respect of the country. Keep it simple and gorgeous in white. Show off some leg as you step into the pool because you certainly won’t be doing that anywhere else in Morocco. Enjoy your time in little clothing before you cover back up and head out in the medina. 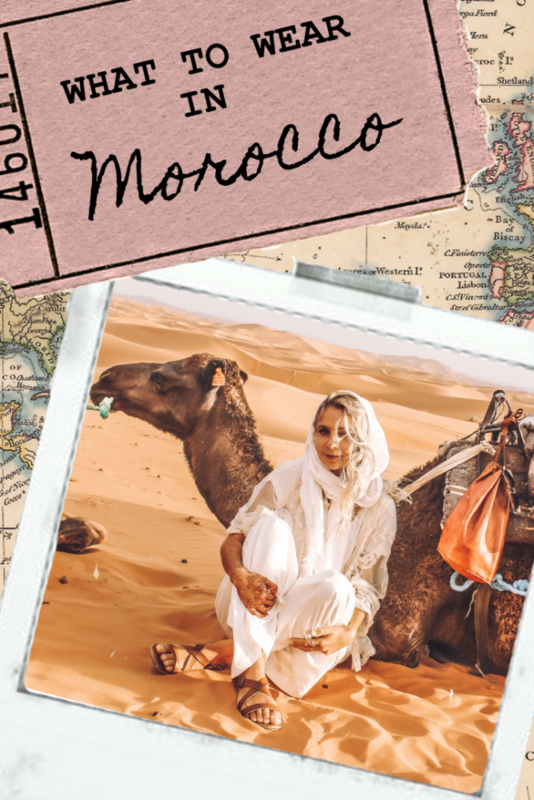 Want my printable check list to packing for morocco? Click this link!!! Don’t forget to Pin What to Wear in Morocco for Later! If you have any questions on what to wear in Morocco, don’t hesitate to contact me using the form below! !